Warning! Contains only exercises for LLDB debugger. This is an update for Accelerated Mac OS X Core Dump Analysis: Training Course Transcript and GDB Practice Exercises (ISBN: 978-1908043405) book. In Mac OS X Mavericks GDB was replaced by LLDB debugger. All GDB exercises were reworked and updated for LLDB. The original first edition also contains slide transcripts and selected memory analysis pattern descriptions which are missing in this update. This update contains only LLDB exercises. 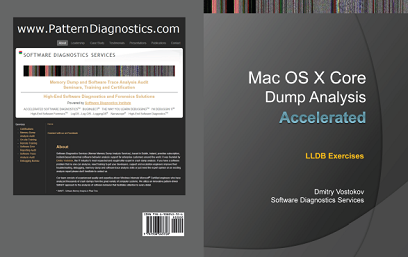 If you don't have the first edition of this course then Accelerated Mac OS X Core Dump Analysis, Second Edition: Training Course Transcript with GDB and LLDB Practice Exercises (ISBN: 978-1908043719) is recommended instead of this update.